$2,600.00 Order of the Red Banner of Labor, Type 2 Variation 3 (with small "Mondvor" mint mark), #11097. A very uncommon piece with a serial number far outside the regular "Mondvor" range. 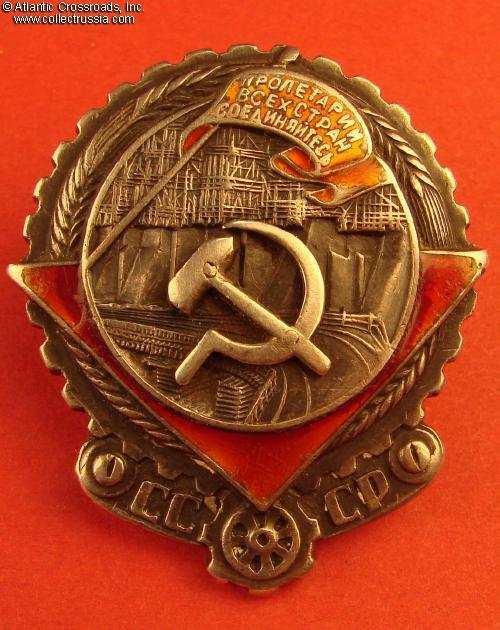 This is one of the few screw back Red Banners of Labor "recycled" at the Krasnokamsk Mint soon after the production was moved there from the besieged Leningrad. In very fine condition, with unaltered screw post and intact enamel on the banner. $775.00 Order of the Red Banner of Labor, Type 3, Variation 1 "jumbo", #28849, circa 1945. A very scarce piece from the small series made at the Leningrad Mint in 1944, with a currently known serial number range of 26261 - 30120. In excellent condition. $250.00 Order of the Red Banner of Labor, Type 3, Variation 1 "jumbo", #47160, circa 1946-47. A very attractive piece in very fine to excellent condition. Comes on a period suspension with old ribbon. $395.00 Order of the Red Banner of Labor, Type 3, Var. 1 "jumbo", #42867, with a document (order booklet), June 1947 issue. In outstanding condition. $160.00 Order of the Red Banner of Labor, Type 3, Var 2, "jumbo" (aka "long oval"), #72252, circa 1948. In superb condition, and includes original suspension and ribbon. $220.00 Order of the Red Banner of Labor, Type 3, Var. 2, "jumbo" (aka "long oval"), #89330, with a document, 1949 issue to a woman. Both the award and document are in superb condition. $170.00 Order of the Red Banner of Labor, Type 3, Var. 2, "jumbo" ("long oval"), #115379, with a document, awarded in July 1951. A year later, the recipient also received an Order of Lenin (which is now missing), so this set may have a good research potential. Both the award and document are in excellent condition. $140.00 Order of the Red Banner of Labor, Type 4 "semi-long oval", #190850, circa early 1950s issue. An outstanding example on original suspension. $140.00 Order of the Red Banner of Labor, Type 5, Var.1 "short oval flat back", #214509, with a document, awarded in August 1952. In excellent condition. $95.00 Order of the Red Banner of Labor, Type 5, Variation 2, "flat back with curved mint mark", #289738, circa 1953-54 issue. In excellent condition and includes original suspension with old ribbon. $110.00 Order of the Red Banner of Labor, Type 5, Var. 2, "flat back with curved mint mark", #340252, with a document (order booklet), awarded in January 1956 to a Latvian woman. Both the award and document are in excellent condition. $90.00 Order of the Red Banner of Labor, Type 6, Var. 1, #458080. Manufactured by the Bronnitsy Jewelry Factory, one of the smaller and lesser known makers that subcontracted the production of this decoration for a short period in 1960s through early 70s. Excellent condition. $75.00 Order of the Red Banner of Labor, Type 6, Var. 2, # 510575, circa 1966-67 issue. A distinctive version with conical rivets from the first series by the Leningrad Jewelry Factory. Excellent condition. $65.00 Order of the Red Banner of Labor, Type 6, Var. 2, #534077, circa late 1960s issue. Excellent example of the Leningrad Mint manufacture. $80.00 Order of the Red Banner of Labor, Type 6 Var. 2, #652230, early 1970s issue. Uncommon version by the Russkie Samotsvety Factory. In excellent condition. $55.00 Order of the Red Banner of Labor, Type 6, Var. 2, #974765, circa mid- to late-1970s issue. A superb example. Includes original suspension.